A backyard wedding is not only beautiful, but since you don’t have to pay a facility rental fee, it can also fit into just about any budget. You can pull the whole thing off DIY, hire professionals, or a little bit of both. 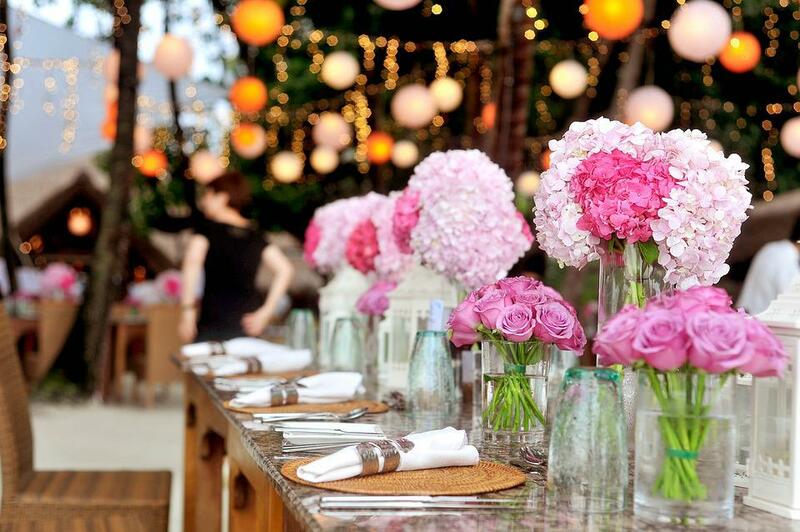 Here are a few tips to help you organize a stress-free, lighthearted backyard wedding. Stringing outdoor lights in a pergola for the wedding altar, in a circle around the reception area or tent-style over the band and dancing area. Outdoor lights will add warmth and comfort during your romantic ceremony. Fairy lights in jars can make beautiful centerpieces for a late afternoon or early evening backyard wedding. Look to DIY sites for ideas on wedding decor, and visit stores like Hobby Lobby or Joann where you can find all the supplies you need without spending a fortune. Look for online discounts or promotions to make your dollars go further. Picking your own flowers from a local community farm or garden, which is less expensive than using a florist and adds a personal touch. It can be a fun outing for bridesmaid bonding. Using candles in glass holders to light the ceremony aisle and as accent pieces for tables. Tables and chairs for both the ceremony and the reception: If you’re trying to save a little space and money, consider having your guests sit at their reception tables for the ceremony as well. Tent rental: Eliminate concern about inclement weather on your big day. Outdoor heater rental: These will keep all your guests toasty if the air gets crisp as the night wears on. Landscaping: Give your lawn a little TLC before the nuptials. 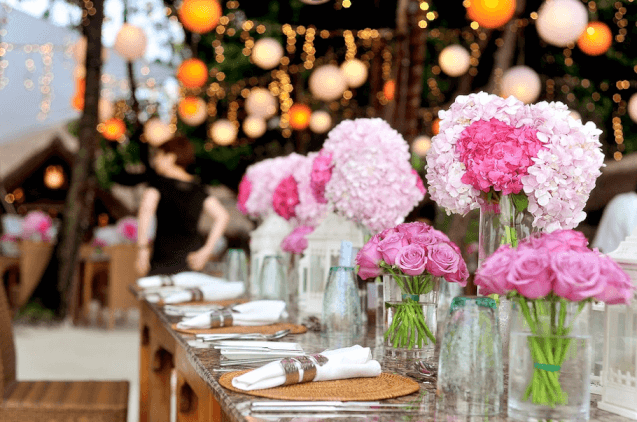 Once you have the layout and decor planned, you can move onto one of the most important aspects of a wedding (at least for the guests): the reception. Using fruit as centerpieces, especially ones that have bright colors, including lemons, limes and oranges. You could also use seasonal produce, such as apples and pumpkins in the fall. Enlisting the help of a family member or friend who likes to be known as the grillmaster to cook for the guests. You can keep it casual with burgers and hot dogs, or take it up a notch with grilled chicken, vegetables or fish. Keeping self-serve drinks and alcohol in coolers made from metal bins, flower pots or planters or rustic crates. Bartenders to mix cocktails and ensure your guests are drinking responsibly. As an added measure, be sure to keep safety in mind if you’re serving alcohol. Linens, glassware, plates and silverware, especially if you are hosting more than 25 guests. At the end of the night, are you really going to have the energy to wash all of those dishes? Having professionals who unload, load and clean can save you lots of time and energy. Portable restrooms, if your house is small and only has one bathroom, or the property is large and guests will have to walk quite a bit to get to the facilities. Serving drinks and appetizers. If you’re envisioning an elegant garden party, then consider enlisting servers who will mingle with the guests while serving champagne and hors d'oeuvres. There is such simple, rustic beauty in a backyard wedding. Not only do you have the charm of a summer sunset or a fall afternoon, but you also have the touching sentimentality of home. Even if the backyard is not yours and belongs to a friend or family member, there is still something special about sharing your vows in a familiar space made special with friends and family.